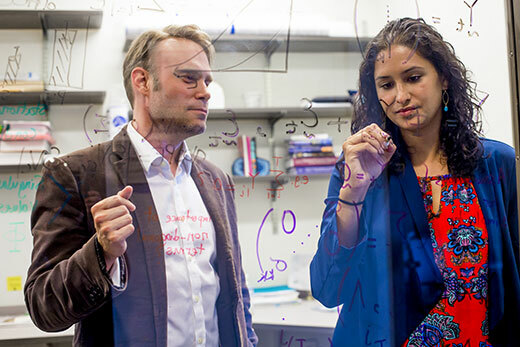 Emory psychologist Michael Treadway (left) works with Amanda Arulpragasam (right), first author of the PNAS paper and a psychology PhD candidate in Treadway’s lab. From deciding to quit hitting the snooze button and get out of bed in the morning to opting to switch off the TV and prepare for sleep at night, the mind weighs the costs versus benefits of each choice we make. A new study reveals the mechanics of how the brain makes such effortful decisions, calculating whether it is worth expending effort in exchange for potential rewards. The Proceedings of the National Academy of Sciences (PNAS) published the findings by psychologists at Emory University. “We showed that the brain’s ventromedial prefrontal cortex, which was not previously thought to play a key role in effort-based choices, actually appears to be strongly involved in the formation of expectations underlying those choices,” says Emory psychologist Michael Treadway, senior author of the paper. Treadway’s lab focuses on understanding the molecular and circuit-level mechanisms of psychiatric symptoms related to mood, anxiety and decision-making. “Understanding how the brain works normally when deciding to expend effort provides a way to pinpoint what’s going on in disorders where motivation is reduced, such as depression and schizophrenia,” he says.